Another 360° panorama - Malvern Link railway station. Located on the Cotswold Line, and which is served by both First Great Western, and London Midland trains. I use this station whenever I go to visit the Malvern Hills. Notes : Railway station located on the Cotswold Line, in Worcestershire. Another 360 panoramic photo - Upminster Railway Station, a National Rail interchange, linking c2c with the London Underground (District Line), and Greater Anglia services to Romford. The station was originally opened in 1885 as part of the London, Tilbury and Southend line. 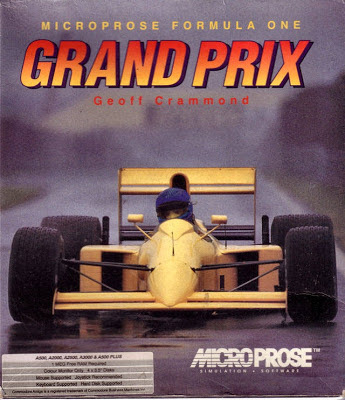 If I can blame my below average GCSE results on someone (other than myself), then it would have to be Geoff Crammond. Why I hear you ask? 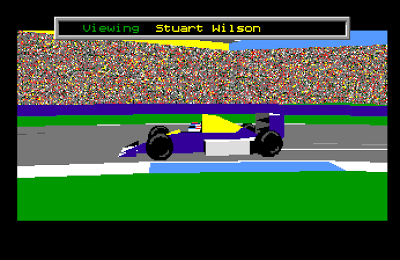 Because he made the amazing Formula One Grand Prix on the Commodore Amiga! 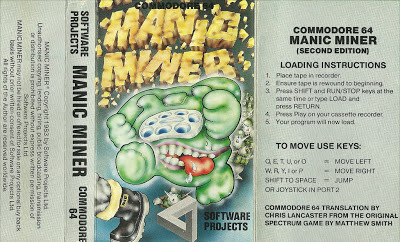 For my first Amiga game that reminds me of my childhood, I bring you this wonderful title, from the creator of some of my favourite Commodore 64 games (namely, The Sentinel, and Stunt Car Racer). Riding at the back of the pack with Stuart Wilson! During study leave at school, I spent countless hours playing this with my friend Philip when I should have been revising for my exams. 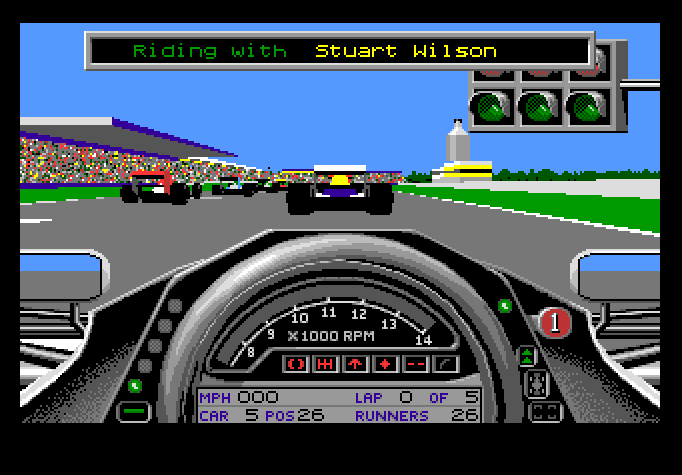 It was without a doubt one of the best, and most realistic racing games on the Amiga, featuring detailed and very fast polygon graphics. 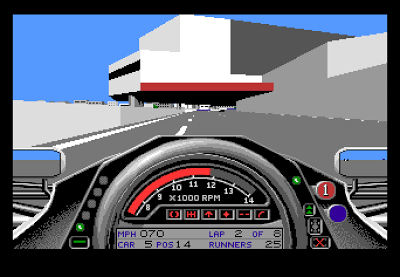 In fact, the game ran amazingly fast on a stock A500, although later on I was lucky enough to get a GVP A530 Turbo accelerator, turning my Amiga 500 from 7mhz into 40mhz. This game ran super fast! Customise your racers and teams. 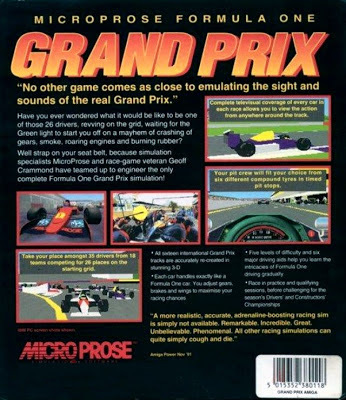 Featuring the sixteen grand prix tracks from the 1991 Grand Prix season, the game was not officially affiliated with the FiA which means that although the car liveries and driver helmets were accurate, none of the drivers were real people and were all fictional. 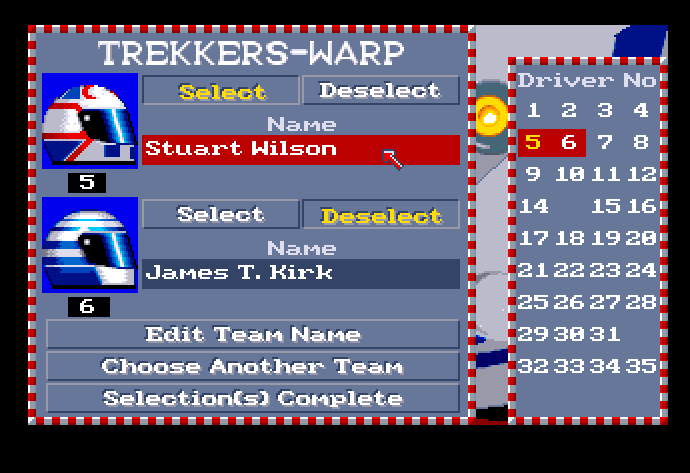 This was great though because the game gave you the option of naming the drivers and teams yourself. 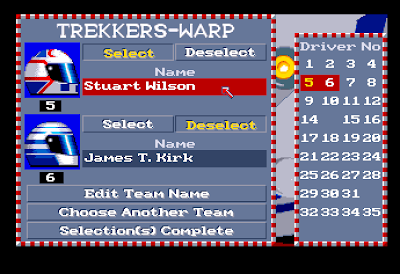 We had great fun naming the racers after people at school, or famous celebrities. 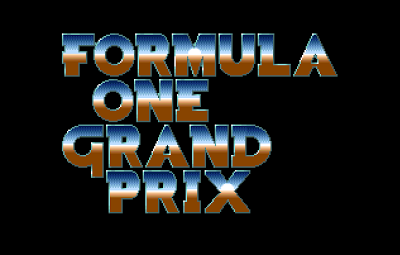 Along with practice mode, qualifying and single races, players could also take part in a full season. The game did allow for more than one player using a unique system that allowed each player to play on their own before the computer took over the car, thus allowing the next person to take control of their car. A novel idea, but very annoying if your car crashed or span out of control when under control from the computer! 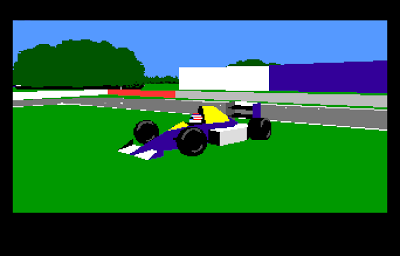 F1GP (as it was known) also had to ability to play the game from different camera angles – a feature not seen in many racing games on the Amiga. Interior and external views were available, and trackside cameras were positioned around the track so that replays could be viewed from almost any angle. 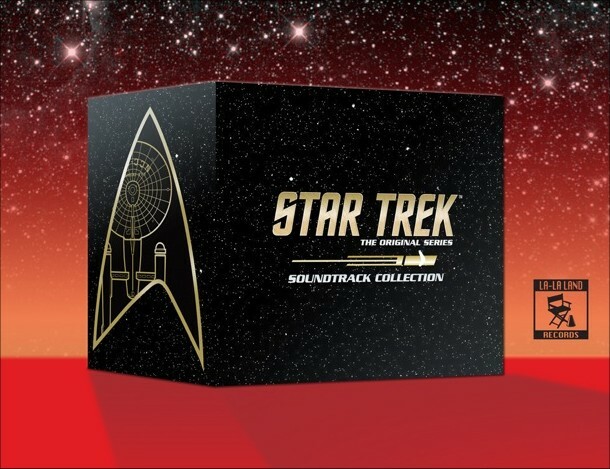 All great stuff. The game was simple to get in to thanks to some great features including “brake assistance”, “steering help”, “damage on/off” and “throttle assistance”. These could be enabled or disabled using the function keys. Some of these made the game too easy, but at least the option was there to turn them off for a much tougher experience. View from behind - note the white 'guide' lines on the road. These could be turned off. I love this game. 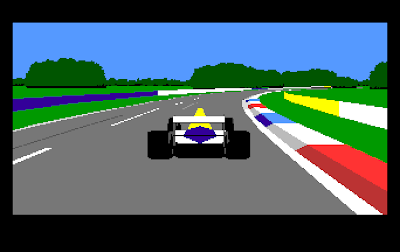 I’m not really that interested in Formula One racing, but this game was fantastic. Geoff Crammond made several sequels after this, and although graphically they are far superior, the original was and always will be the best. 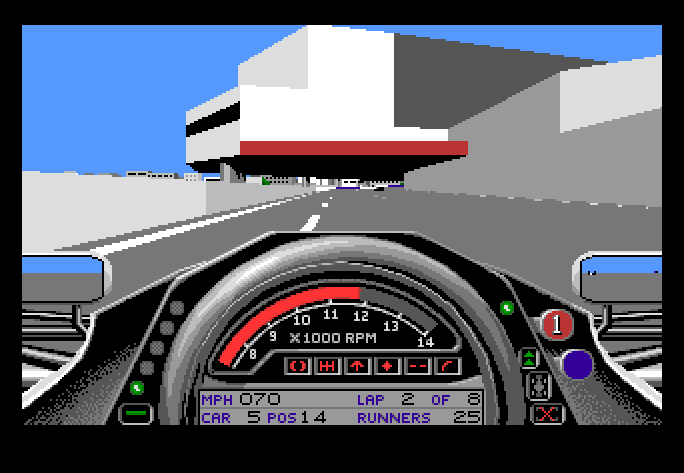 AND, it was always fun to race round the track the wrong way, smashing in to the computer controlled cars. 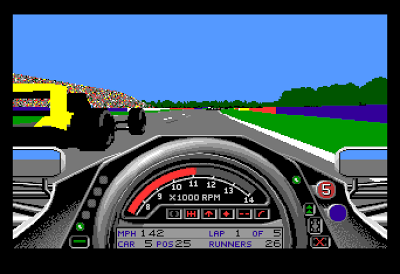 Once they had all been smashed and taken out of the race, I could then turn around and finish the race, knowing I would win because I was the only car on the track! The famous Monaco track, in all its polygonal beauty. Anyway, one game I have been playing today is a classic that I am sure you all know. 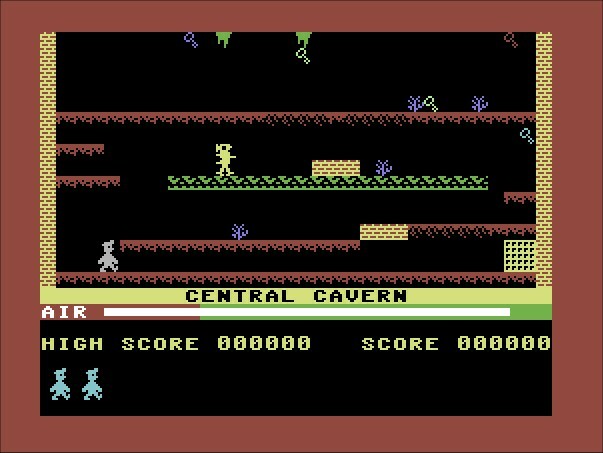 Ask anyone my age to name the first level of this game, and I'm sure the majority will immediately answer "Central Cavern"! 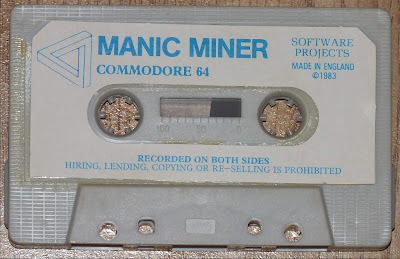 I suspect that anyone who had an 8-bit computer in the 1980's probably had (or heard of) Manic Miner. Released in 1983 and originally programmed by the very talented Matthew Smith, it was the first game to feature Miner Willy. 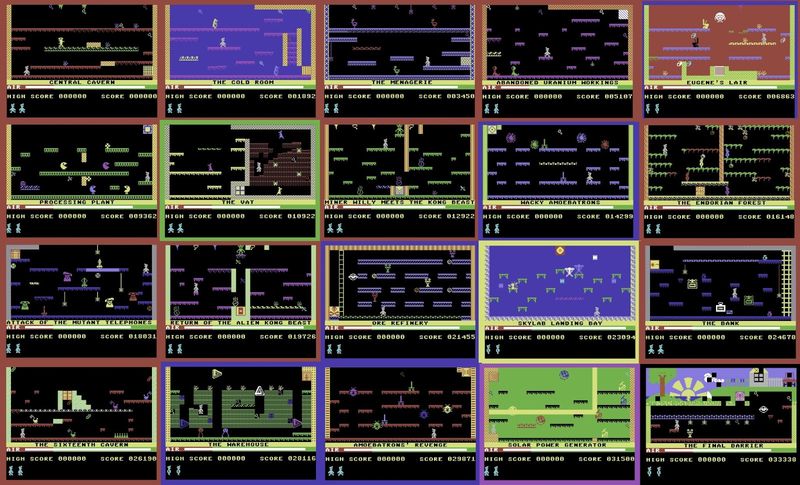 Willy of course would re-appear in several sequels, namely the Jet Set Willy series of games. The game is your simple platform affair. 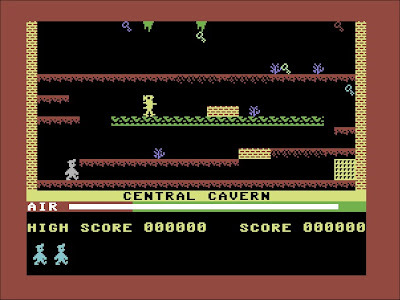 You control Miner Willy, and must negotiate each of the twenty caverns, collecting all of the flashing objects before Willy's oxygen runs out. 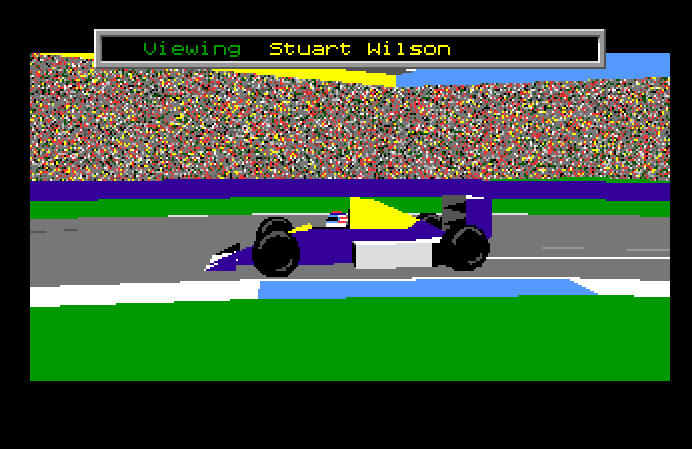 Once all objects have been collected, a flashing portal appears which then allows Willy to move on to the next level. 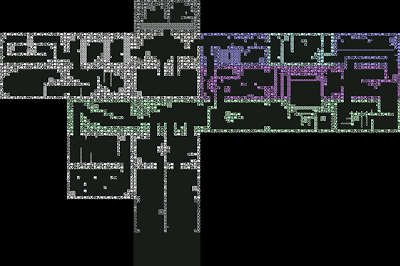 Numerous enemies stand in your way, namely Poisonous Pansies, Spiders, Slime and Manic Mining Robots! Willy can also die if he falls too far, meaning that many jumps need to be done with perfect precision. 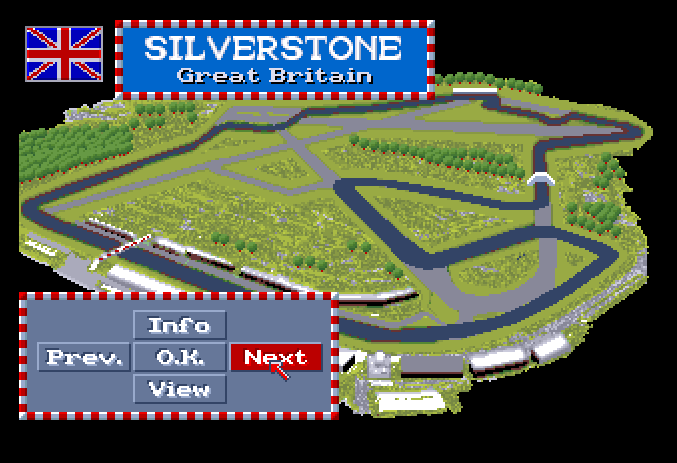 Many afternoons after school were spent playing this gem of a game, and it's still great to play today, although I still find some of the later levels near impossible! Todays "Song That Remind Me Of My Childhood" comes from a song that was playing on my car stereo during the drive to work this morning. There are a few songs/groups which I think are the epitome of the New Wave/New Romantic scene of the 1980's. Groups such as Duran Duran, Spandau Ballet, Frankie Goes to Hollywood, ABC define the popular music of this decade, and whether you like them or not, their impact on my generation was massive and will forever be remembered as a big part of our youth. Doctor Doctor, by the Thompson Twins is another example of this. The simple 4 note electronic intro sets the mood for a fantastic bit of 80s nostalgia. Released in February 1983 and reaching number 4 in the UK charts (back in a time when listening to the UK charts was actually an enjoyable experience), have a listen to this... and enjoy. 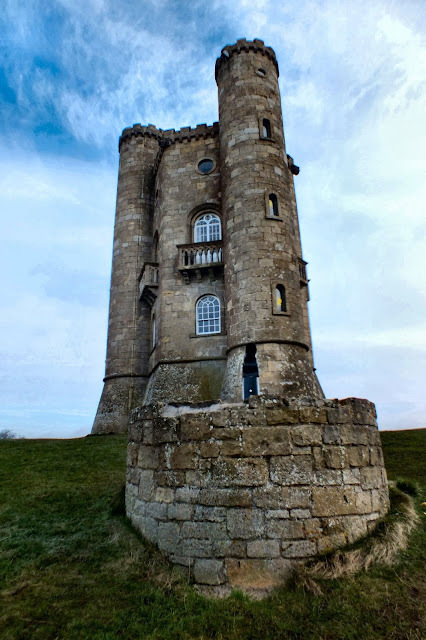 Another 360 panoramic photo - this time, it's Broadway Tower, a folly not too far from where I live. 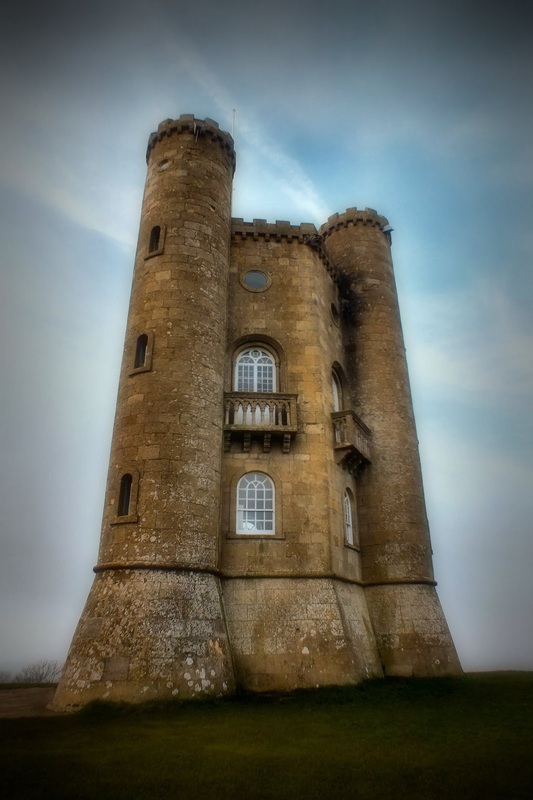 It was quite a miserable day, but I was able to take some pleasant pictures of this fascinating building. I must return in the spring/summer. 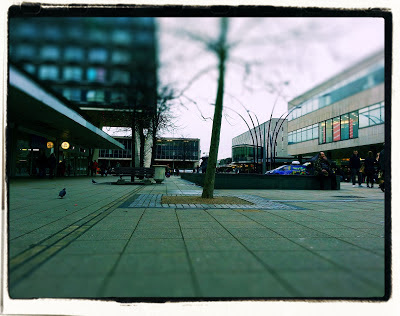 Notes : A dull, cold January day. I was going to post something about this mornings The Mirror's ridiculous article about computer games increasing the risk of cancer in children, but instead of just angering myself even more about such utter nonsense I am going to post my next "Games that remind me of my childhood". 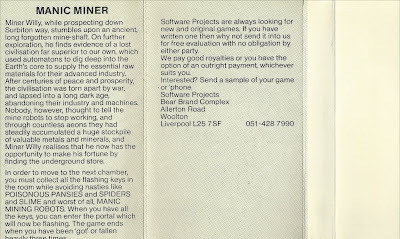 Mastertronic games were always hit or miss. 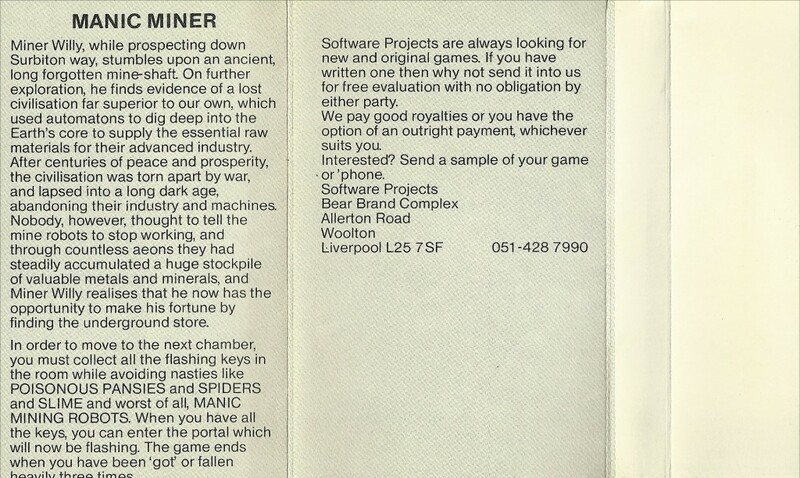 For £1.99 it could either be a turd of a game which you would never play again, or a gem which would keep you entertained for many hours. Fortunately Video Meanies falls under the former. 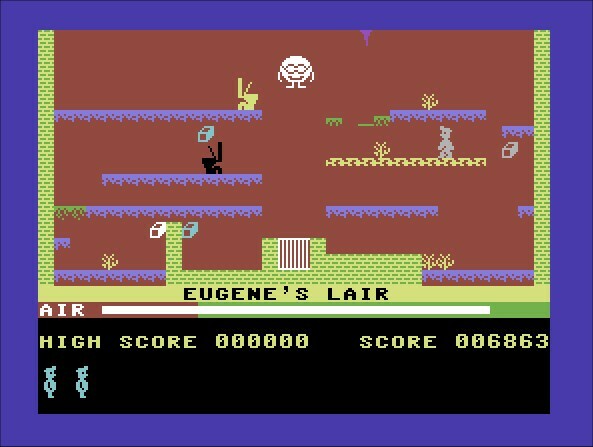 The game is yet another classic by Tony Kelly (Squirm, Big Mac) and is in my opinion another fine example of a Commodore 16/Plus 4 game being better than its Commodore 64 counterpart. Released 27 years ago, the game has you control a robot and you must negotiate 24 rooms of the castle, turning off all the videos whilst avoiding the Meanies that populate each room. At least, that's what the instructions say. 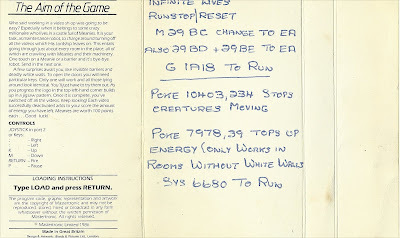 They don't make games with stories like that anymore! 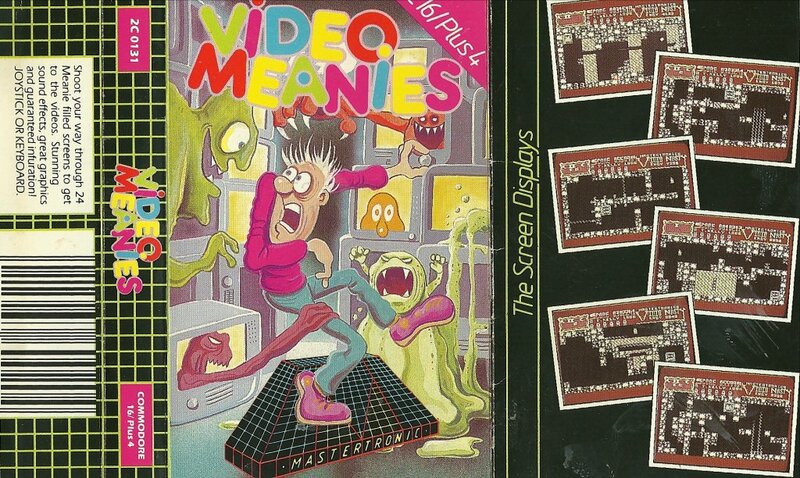 Fortunately you can shoot the Meanies, but they re-appear after a few seconds. Invisible barriers, laser beams and deadly white walls which kill you when you touch them are just some of the dangers within the castle. 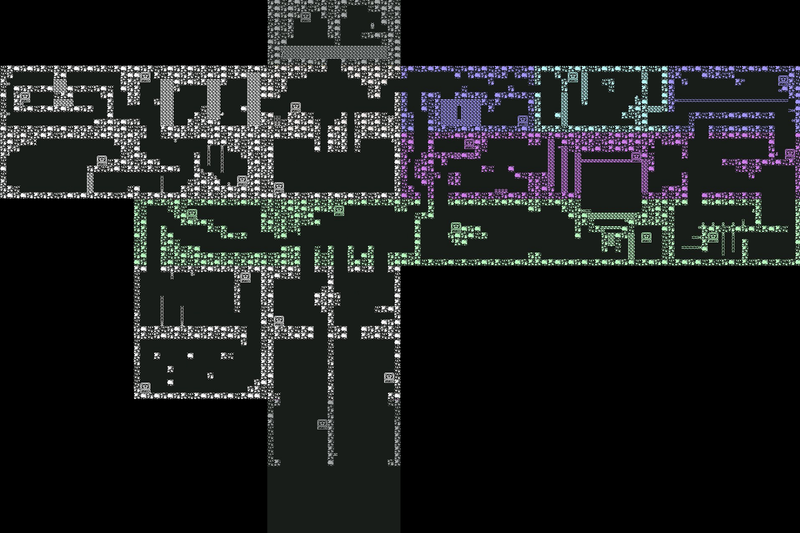 Also, you must locate keys which unlock doors, allowing you to explore even further. As you turn the videos off, a jigsaw puzzle is revealed at the top of the screen. Once you have turned off the videos and collected all of the puzzle pieces, the game is over. One of the things that stood out about this game for me was its sound effects. 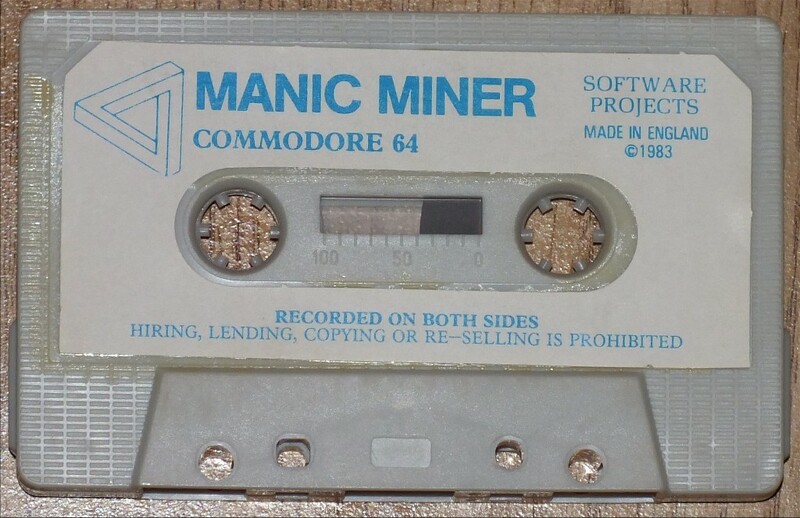 The TED chip on the Plus 4 was inferior to the C64's SID chip, but the sounds in this game are amazing. 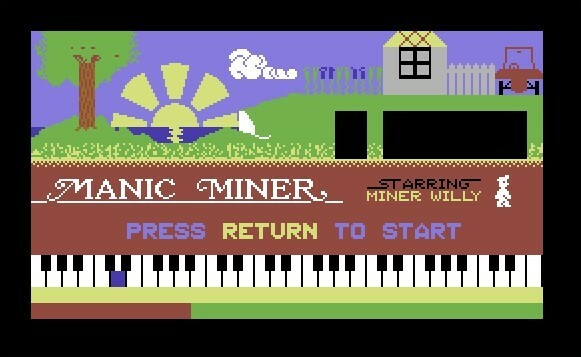 Even the simple one-voice tune on the start screen is a jolly little ditty which I still hum even to this day! 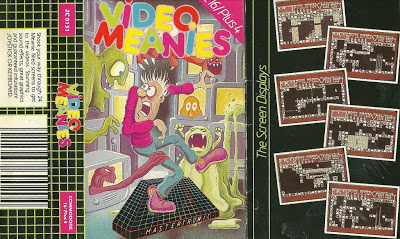 Interesting fact is that the game was apparently going to be called Video Nasty, as shown by the early screenshots on the back cover of the game inlay. I guess they never updated them when the game was finally published. 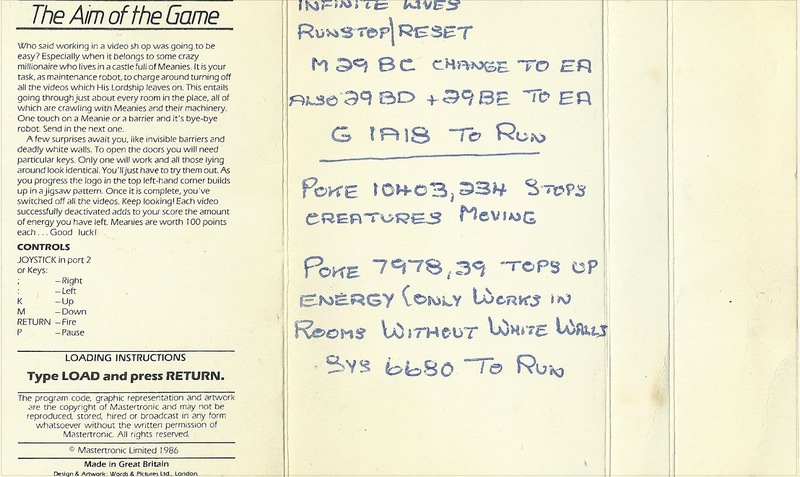 Instructions, complete with cheats hand-written by my Dad! Gosh, I really love this game! Another 3D panorama for you to explore. This time, Regents Park station on the London Underground! 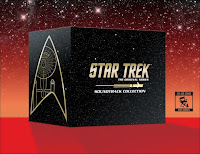 I'm going to start yet another new regular feature here on the Captain's Blog. 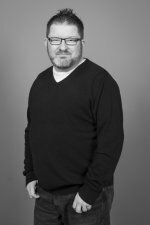 I plan to merge my "Stuart Wilson's Panoramic World" website with this blog, so expect to find some interactive 3D panoramas popping up here every now and then for you to look at. 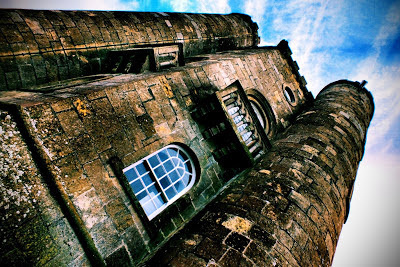 I love 3D panoramas as they are a wonderful way of preserving a single point in time, allowing the user to see all around, as if they are actually standing there. In fact, I am amazed there are not more of them available on the web considering that most cameras and mobile phones have the ability to take these photos now. Consider these to be ones that the Google Street View camera can't reach! Notes : Five Links Estate (Handley Green - Now Beeston Courts). My old home. Why is it, whenever I see the Daz advert on TV (the one with Daley Thompson), I always think the guy at the end who is about to jump in to the swimming pool looks like John Prescott! And so completes the first trip of 2013 to Chavtastic Basildon Town Centre. Long gone are the halcyon days when one could pop into Bas and spend a fortune on budget £1.99 games in Software Plus (where QD is now, before it moved into the Eastgate Centre by the bus-stop), or spend an entire afternoon perusing through Star Trek memorabilia and comics in The Cartoon Shop (is it still open and if so, does John still run it?) without the risk of getting mugged, or abuse shouted at you by some rude pensioner with a chip on their shoulder. Instead, the only enjoyment these days is watching mobs of tracksuit-clad youth (with their tracksuit bottoms tucked into their socks) ogling at what they can spend their dole money on in Cash Converters. Oh... and playing "Spot the Newly Opened Pound Shop" game. A fun way to entertain three bored children whilst they wait for their reward for being patient... a trip to Toys R Us! Still, I can't complain. Basildonia, offers so much more than Evesham in terms of shopping variety. That's not to say it's any good though - It's as hard to spend money in Bas as it is in Evesham. AND, I am very proud of myself - I drove up and parked in a multi-storey car park today for the first time. GO ME! Over two years of driving, and I've never experienced the delights of driving to the top up until now. Still not as fun as getting squashed by a boxed Aquavax in the back of Steve Ready's Dads car while going up the twisting multi-storey at speed in to Eastgate back in '86 - bloody hell, has it really been 27 years! Also... What's this? Three posts in as many days! EDIT : Before anyone starts whinging at me, I would just like to add that I am not dissing Basildon. Far from it. 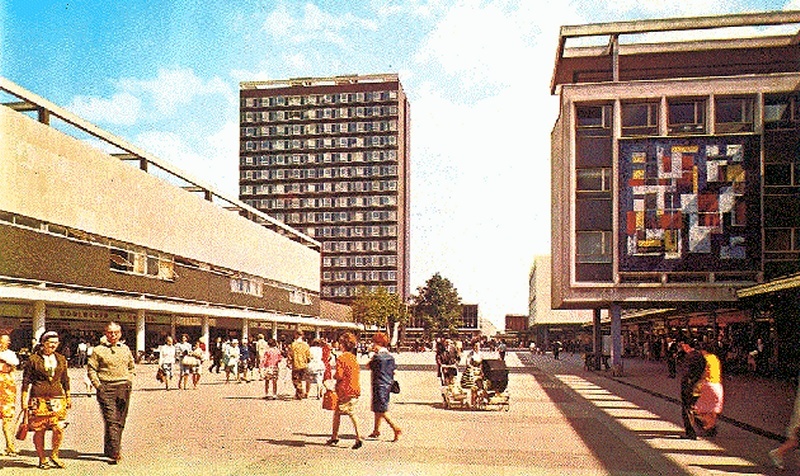 Basildon was, and always will be my first home. 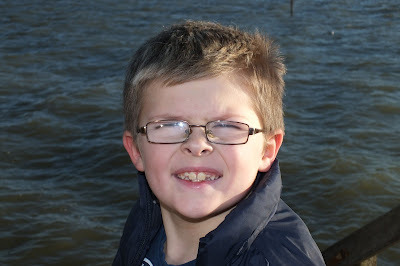 My views and opinions are only that of an outsider of the town, and are based on observations which I have made during our many visits to the area each year. Nothing beats seeing in the New Year back home in Laindon, and going for a pleasant stroll along the seafront at Leigh-on-Sea with my son, Kieran. Shame everybody else had the same idea and went too! I don't think I've ever seen it so busy, even during the Summer. It was still nice though. Oh well, two more days, and then we're back off 'home' to Evesham. Feeling a bit miserable to be honest. I really miss it here. I suppose it's a combination of having to return to Evesham, and to the usual stress of work, and stuff.